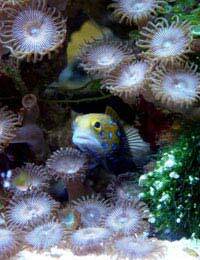 Gobies are a very large and varied family of bottom-feeding fishes popular in marine aquariums. Small and with a distinctive long-bodied 'torpedo' shape they come in a range of striking colours. They're active, assertive, and relatively resistant to disease. What's more, they can help to keep your aquarium clean. Although members of the same goby species sometimes become aggressively territorial with one another (make sure you have room to separate vulnerable individuals if this happens), they do well in community tanks with other fish around their own size. Unfortunately, there's something about gobies which makes them look or smell delicious, and larger fish can't resist snacking on them, so be careful what you keep them with. Ideal goby diets vary by species, but all require live food some of the time; small shrimp and crustaceans are a particularly popular choice. Make sure they also have access to vegetable matter for roughage. They thrive in environments where there are plenty of small invertebrates in the water or substrate. Some prefer to feed at night, so if you don't see them eating you should try observing the tank immediately after lights-out. Gobies like to dart around, chase, and sometimes jump, so make sure your aquarium has a secure hood. Clown Gobies -Also known as coral gobies, these tiny fish are ignored by predators due to a slimy coating which makes them taste awful. They live on Acropora coral and are notable for their bright colours. Neon Gobies -Small, brightly coloured and extremely hardy, these 'cleaner fish' will remove parasites from your other fish and keep everyone in the aquarium happy. Hover Gobies -Available in several beautiful varieties, these fish can be a little delicate but will do well if provided with a varied diet. They like digging and will keep the sand in your aquarium clean. Coryphopterus Gobies -Notable for their fused rear fins and the way they seem to walk along the bottom, these personable little fish are comparatively hardy. Lythrypnus Gobies -These species have the most vivid colours of all the goby family. They prefer comparatively cool water and need small crustaceans for food. Sleeper Gobies -Growing up to six inches long, these fish are omnivorous and fairly disease-resistant. Avoid rocks and heavy ornaments in the aquarium, as their digging may overturn them. Gobies can be bred in captivity, but it's difficult to do. In the wild they breed in the rainy season, so gently decreasing the salinity of your aquarium water and raising the temperature may induce spawning behaviour. In most species the males (usually slightly smaller and slimmer) build nests and try to persuade females to deposit eggs in them, then guard the eggs and any fry which hatch. However, stressed gobies may eat their own eggs and fry, so it can be advisable to separate them at an early stage. In ideal conditions the male should be left with the eggs at least until they hatch, as he will fan them with his fins to keep them at the right temperature. Aside from the sheer number of goby species available, it's difficult to generalise about them because they vary a great deal as individuals. Many aquarists feel that their gobies exhibit a lot of personality. Although they tend to be shy when newly introduced to an aquarium, needing plenty of hiding places, they often go on to be highly sociable. If you're looking for attractive, intelligent fish which don't take too much looking after, gobies make an excellent choice.